I don’t want to dwell on the topic of snow in Boston, its magnitude, and its voracity in disrupting everyday life and work. Instead, let me show you this awesome hat I knit up! 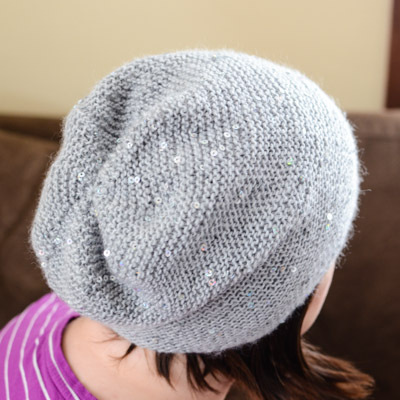 Pattern: Rikke Hat by Sarah Young. Yarn: Rozetti Polaris, in color Cloud Cover (61003), almost 1 full skein. The yarn is 65% acrylic, 31% wool, and 4% payette. It’s a lovely yarn – a bit heathered, with one ply being acrylic/wool, and another thread-like ply holding the payettes. The only minus is that it’s pretty annoying to frog, but I didn’t have to do much of that while knitting this super simple pattern. Needles: US 4 and US 6 needles. The hat is knit in garter stitch, and the pattern is written to be worked in the round, alternating rounds of knitting and purling. I weighed the option of purling every other round versus knitting the hat flat and adding one seam, and decided to knit the hat flat. I’m glad I did! The hat is not any worse for it, and the seam lets me find the back of the hat instantly. I seamed it using a smooth wool sock yarn… seaming with payettes wouldn’t have been pretty. And now to the topic of THE GIVEAWAY! ETA: The giveaway is now closed, thank you for participating! I do love the way this hat came out, but looking at myself in the mirror only confirmed what I already knew – that I prefer my hats to be close-fitting caps or a more traditional silhouette, not quite this slouchy. And so, if YOU like this hat, please leave a comment on this post between now and 9 p.m. on Friday, and I will select a winner at random to receive this hat! This hat is quite stretchy and should fit the average adult head (mine is 22.5″ around). Please read here for full rules of this contest, and good luck! What a lovely hat! I’ve had it in my queue for ages and would be honored to own one knit by you! I’m from MN and you are getting out weather. Sorry about that. I think it looks good on you, but if you’re not happy with it I would love to wear it! The haat is super cute. So is your new header. Have you told us about that scarf? Probably. I am pretty forgetful..
Good use of a snow day! Hope you aren’t having too much trouble digging yourself out! Thoughts are with you during this snowy time! i love the hat! Either way it’s in my queue. I love the sparkles. looks perfect for everyday wear. I love the hat! Here in Oregon it is unusually warm. The hat would be perfect! I love this hat. It would go with the infinity scarf I just made. I hope I hope I hope!!!! How funny! I was thinking how much I liked that hat, and if I could easily find yarn like that to make one, and then find at the end of the post that you are giving it away! I love it, and it would get a lot of wear around here! Love the hat!! Also, I second the opinion that we have not heard about the lace up top. It’s beautiful! I love the bit of glitz from the payettes; what a fun hat! I think you look great , but I also think I would look good in that hat. Up to you. It’s lovely! Would love the hat, if you are really sure you don’t want it. I also love the lace in your header and would like to know the yarn and pattern. The hat looks wonderful! I love the pattern and your yarn looks perfect for it. This is fabulous hat, and I am sorry you don’t like it. It looks good on you! I would love to have it, but I will just have to knit my own if I don’t win. What a beautiful hat! It has a lovely subtle sparkle to it. Even our weather in North Florida is now cold enough to wear hats, scarves and mittens. I’m coming around to slouchy hats lately. They don’t mess up my curly hair as bad. I used to avoid slouchy hats for years and, after knitting one for a friend and trying it on to check sizing, I decided not all slouchy hats are created equal. This looks cute! It’s a pattern in my queue but I wouldn’t have thought to use this yarn. Great combo. 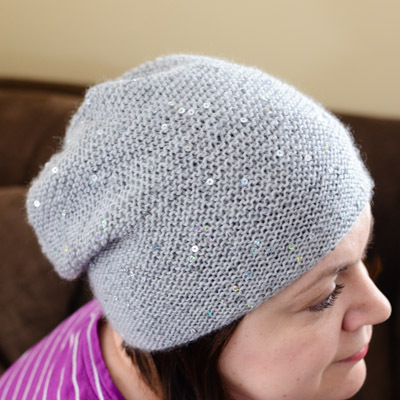 My daughter-in-law loves slouchy hats and I love her – would be fun to give to her! It’s a great hat! I have made this hat before…love it!…I’ll have to try knitting it flat. I love slouchy hats. They really work with my curly hair. Your lovely rikke hat is wonderful! I love the knit – and the seam is fine! Like you said – you know where the Back is! I think the hat is really cute. I need a new hat but am always too busy knitting for everyone else to get a hat knitted for myself! I’ve made a Rikke and it’s my favorite go-to hat. Your choice of yarn is lovely – it dresses up the pattern beautifully and looks like sparkly bits of snow! I think it would look great on my niece. Thanks for the giveaway. Very pretty hat. Lovely sparkles. I’d like it! I do like the hat a lot. Any time you can add a little bling to something it works for me. What a great hat! I love it! Oh wow, it’s too bad you don’t like it, I think it looks great and the sequins are so fun! I have been contemplating knitting a slouchy hat for a while and this pattern might be a contender. Don’t give it away; it looks gorgeous on you!! Gorgeous. I have seen that yarn in my LYS but wasn’t sure what to knit with it. Good idea. I could sure use it here in cold Minnesota. We don’t have the snow this year like you but the temp tomorrow will be 30 below zero with the wind chill! What a beautiful hat! I’m in DE and we just got our first substantial snow fall of the year, so I’m not sick of it just yet. I have three daughters that take hats and cowls off my needles as quickly as I can knit them. I would love to have a beautiful hat for myself. And though it’s nothing like what you’ve been getting, it’s cold and snowy here in Oklahoma! I love the hat, and love slouchy hats in general. I have a huge head, though. I just measured it at 23.75 inches. So if you think it would be too small, skip over me. What a great hat, I’ve had it in my queue for a while. But I really love your yarn choice, it kicks it up a notch. I’ve been on a hat kick lately myself. I’d love a pretty,slouchy,spangled hat to chase the winter blues away. Who wouldn’t feel happier wearing something sparkly and warm? I think it’s a lovely hat and you look lovely in it, but if you must …. I think the hat looks very pretty on you, but if you don’t like it, then that is very nice of you to have a drawing to give it away! I love the sequins on it! I recently discovered, much to my chagrin, that “slouchy” also can mean “droopy”, particularly when applied to a hand-knit hat (scroll down to letter #3). So sad. As beautiful as your hat is — and I really mean that — please do not put my name in your drawing. Let’s leave the slouchy hats to the models. I’d love to have the hat! I used to like close fitting hats, too, but now that I’ve moved to a different climate I think a looser, slouchier hat would be better. A slouch such as this could light up the skies up in the grey north of Scandinavia. We love hats! I adore this hat and pattern! I knit one for my daughter earlier this winter and have still not gotten around to making myself one. Your choice of yarn and colour is right up my alley ???? I would love to win this! It’s a lovely hat. I know since I wear every day. Should your lovely hat find its home with me, it would be cuddles, admired and worn often! Thanks for the giveaway. Beautiful! I love the hat. I love the color of the hat, nice work! Beautiful hat. I would love to win it. I think it’s becoming on you, but if you don’t, I would be happy to have it. It IS a very nice hat! I would give it to my lovely teenaged niece who wears slouch hats just about all the time and this one would match the scarf I knit for her for Christmas! This is absolutely adorable! Love it. My current hat is a little too slouchy – it makes my head look like the top of a mushroom. It is warm, however, which is really what matters!